to the ecosystem and to provide a nice atmosphere and above all healthy. All rooms are heated by a biomass plant (wood). This family-run 3-star from three generations, has 30 cosy rooms that smell of larch wood, of which 6 new family rooms made to the attic floor, designed with of space, light and design. We offer complimentary amenities such as spacious private parking, WiFi in the hotel, Park-Garden with scenic Sun terrace equipped with sun loungers and shaded area, organize fun evenings after dinner in the family hut, with mulled wine, typical local pastries and such ... so much fun! If you are a fan of good food... Let us, will delight your taste buds with our specialities. In the à la carte restaurant at hotel Belmonte, the cuisine is based on seasonal ingredients. Gnocchi, pasta and desserts are homemade and the chef puts a great emphasis on firings. Hearty and rich in quality products the buffet breakfast. 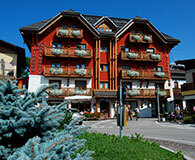 The portal Asiago.it not impose any fees on the reservation and booking direct with the accommodation without any intermediary.